It is very dangerous to slip on decks. If you plan to install decks by the pool or in a humid environment such as frequent rain, you will first be concerned about the safety of decks. Sunlight and rain can cause wood to crack or rot, and mold growing on decks can also make decks slippery. With composite decking, you don’t have to worry about this problem. This durable and low-maintenance composite material does not crack and rot and does not need paint after long-term use. Most of the WPC decking has moisture-proof properties. Compared with other composite materials, the WPC decking products we designed and manufactured are more focused on improving the anti-slip performance. WPC decking looks and feels like wood, but is actually made of high-density plastics and wood fibers, therefore harder than wood. 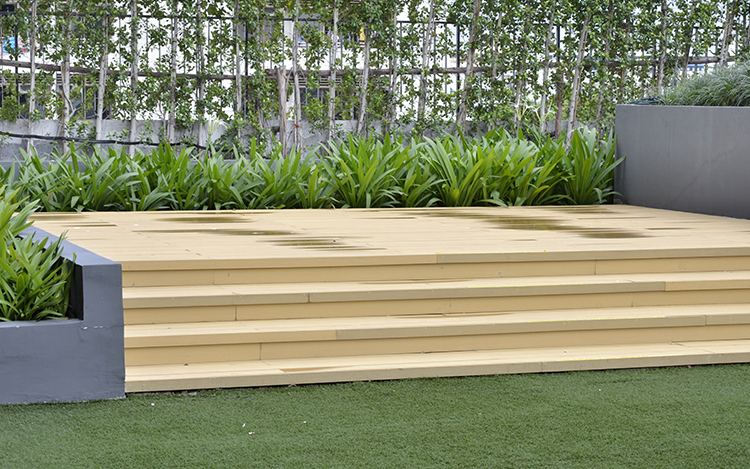 At present, some WPC decking is covered with a layer of plastic on the surface, but the plastic surface is smoother. The surface texture of plastic-wood mixture is similar to that of wood and has a rougher surface to further improve the anti-slip performance. Each WPC decking we make is treated with two different surfaces, one side with a smooth surface and the other with grooves. Where better slip resistance is required, the grooved surface can be mounted upwards, and it is not easy to slip on barefoot or shoes. Sometimes slippage is caused by mold on the deck surface. Molds do not grow on composite decks, but pollen, leaves or other debris on decks can cause mold. It is important to note that soap and water are used daily for regular cleaning to keep the decking clean.